Mergio’s health has worsened, and he’s decided to step down as CEO. He’s been replaced by Jeep boss Mike Manley. Update: I may have jinxed the the poor man. I feel terrible now. 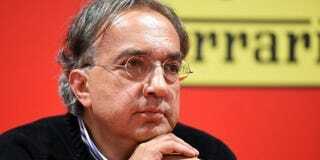 Sergio Marchionne passed away this morning at 66. He was a great businessman who tried to put life back into Chrysler and gave us some of the best cars on sale today through the Abarths and Alfa Romeos. I’m gonna miss him.